ABC Pest Control Sydney Cockroaches. The American cockroach is 1.5 inches long, making them the largest of the house-infesting cockroaches. The American cockroach generally lives in moist areas, but they can survive in dry areas if they have access to water. American cockroaches prefer warm temperatures. In residential areas, these cockroaches live in basements, around pipes and sewers, and may move outdoors into yards during warm weather. These cockroaches can be found in basements, crawl spaces and foundations. If you have any issue with cockroaches don’t hesitate to contact an expert now. Or check out our competitive packages. Nymphs hatch from egg cases that the adult female cockroach deposits. As the nymph grows, it sheds its “skin” or exoskeleton so it can get larger. Each nymphal stage is larger than the previous one, and an adult cockroach emerges after the last nymphal stage. 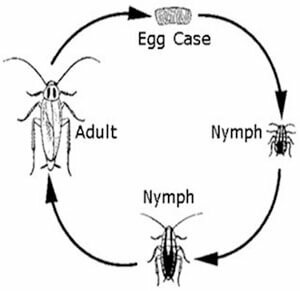 The figure shows a simplified image of the life cycle (egg stage, nymph stage and adult stage) of the German cockroach. brown or black in color. Cockroaches require food, water, and places to hide and are, therefore, found in situations where these requirements can be met. They are nocturnal, remaining hidden during the day and becoming active at night to obtain food and water and to reproduce. 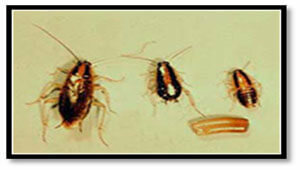 The German cockroach commonly occurs in kitchens; the American cockroach appears more often in food establishments, and the Oriental cockroach is usually associated with dampness around sinks or in basements. Cockroaches are not normally encountered by man unless their populations become very large. Cockroaches will eat almost anything: left-over human food, wood, leather, cigarette butts, toothpaste, milk, sugary materials, coffee grinds, glue, soap, feces, fabric, shoes, paint, the glue on the back of wallpaper, human hair, fingernails, etc. Fact: The German cockroach is the most common house-infesting cockroach and the number one pest in Sydney. Fact: The word cockroach comes from the Spanish word “Cucaracha” which means “crazy bug”. Fact: There are about 4,000 different species of cockroaches in the world. About 30-50 species live in Australia. Fact: The world’s largest roach lives in South America and is 6 inches long with a one-foot wingspan.